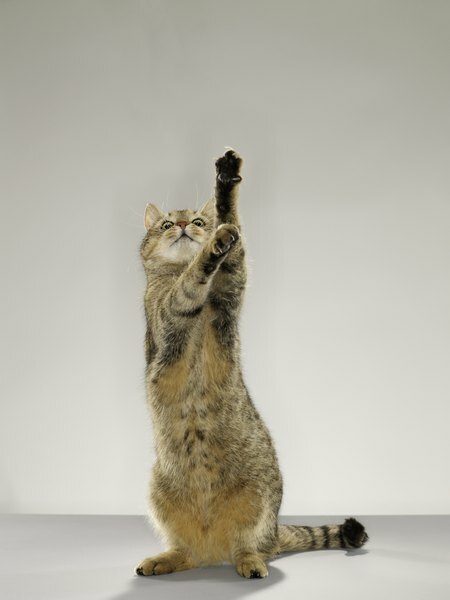 Raise your hand if you're sure Glucosamine is just amazing! Kitty's getting a little long in the tooth and isn't nearly as active as he used to be. Perhaps a joint supplement will get him moving comfortably again. Cosequin and Dasuquin are two well-known joint supplements, both made by Nutramax Labs. Which one is the best for Kitty? Old age catches up with cats just as it does people. You might notice that Kitty seems stiff when he gets up from a nap, or he's not running around or jumping on things the way he once did. If he has arthritis, jumping and running likely cause pain. Arthritis occurs as the cartilage wears away in the joints, so there's less cushioning. In advanced arthritis, movement means bone hits bone. Joint supplements work by slowing the breakdown of cartilage and maintaining what's left. Each 125 milligram capsule of Cosequin for cats contains glucosamine hydrocholoride, chondroitin sulfate and manganese ascorbate. Cosequin helps provide support for Kitty's joint cartilage. Nutramax Labs recommends starting Kitty on Cosequin as soon as you notice signs of arthritis. Speak to your vet about Kitty's joint issues. 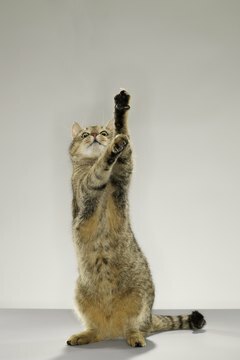 She might also recommend diet and exercise in addition to Cosequin, as overweight cats put more stress on their joints. Cosequin is available in fish and tuna flavorings, which you can pour on or mix into Kitty's food. You should see an improvement in Kitty's movement within four to six weeks after starting daily Cosequin. Maintenance dosing for long-term use for the average cat is one capsule every other day. Your vet might suggest Cosequin if Kitty has urinary tract issues, as chondroitin sulfate helps strengthen the bladder's lining. Dasuquin capsules contain the same ingredients as Cosequin and add avocado/soybean unsaponifiables or ASU, and tea. The additional ingredients strengthen the effects of glucosamine and chondroitin, as well as providing antioxidants. Unlike Cosequin, which you may purchase over-the-counter, Dasuquin is available only from veterinarians. Expect to see results in approximately four to six weeks after starting supplementation. As with Cosequin, Dasuquin may also aid in strengthening the lining of the bladder. Also available in capsules, Dasuquin is administered the same way as its sister supplement. The substances in Cosequin and Dasuquin produce few side effects. Some cats might vomit up a capsule given to them, with others might experience diarrhea when first taking the supplements. Reducing the dosage will probably clear up loose bowels. If Kitty is diabetic, monitor his blood sugar levels carefully if you're giving him glucosamine, or ask your vet about alternative joint supplements. Neither product has any known interaction with other drugs, but you should always tell your vet about any medications or supplements Kitty is receiving.